America loves its big trucks; so much so the Ford F250 was, and still is, one of its best-selling vehicles. Us Aussies have a fair bit in common with the Americans – big trailers, big spaces – yet we’ve never really warmed to the large utes in the same way. Are we missing out? A few of us think so, which is why companies like Performax offer high quality, fully engineered right-hand drive conversions. We don’t have space to describe the process, but you wouldn’t pick the result as a conversion and there’s a five-year warranty backed by 20 dealers across the nation. To find out more about these big trucks I was dispatched to Queensland for a three-way tow test comparison between an LC200, a Ford F250 and a Chevy Silverado. Suffice to say there’s pros and cons of each… but when it comes to big trailers, a big truck can’t be beat. So towing aside, let’s think about how these giant utes might work as 4WD tourers. 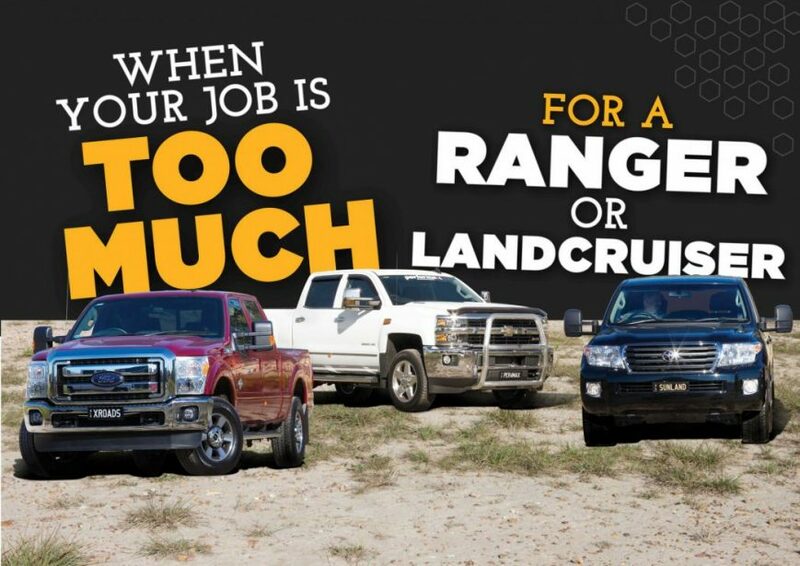 These trucks do not want for gadgets or features; especially the Ford. As a guide, the top-line Lariat and LTZ models from Ford and Chevy are around the VX/Sahara level. On both vehicles the power seats are about as adjustable as those in a top Euro limo, and they’re also both heated and cooled. The F250 has Ford’s Sync 2 infotainment unit (shortly to be Sync 3), same as the local Ford passenger car line-up. There is leather, Bluetooth, cruise control, satnav, reversing cameras and so much storage you could almost camp in the cabin. Oddly though, the gloveboxes are relatively tiny. These are full dual-cab utes, with a wider second row than anything else on the market but also with probably more legroom than most big wagons (and definitely more than any utes like the Rangers and HiLuxes et al). Yet the trays are long at 2m, compared to 1.6m for the dual-cab Ranger PX. Payload varies but is typically over a tonne; and did you notice in the photos how far back the wheel is relative to the tray? That long wheelbase means stability and being able to put the load properly over the wheels, but it comes at a cost when you consider the turning circle and the ramp-over angle (neither of which is a huge issue from a touring perspective). Out on the open road you don’t notice the size of these trucks… most of the time. The high driving position, the abundance of torque and a very intelligent gearbox all combine to make for a relaxed driving experience, except for the F250’s indistinct steering – the likes of which I’ve not seen on anything without an 18-speed gearbox. The Chevy is a sportscar by comparison, although even it isn’t as good as the LC200. Neither rides or handles as well as a large 4WD wagon, and although they share a leaf-spring live rear axle with the smaller utes the handling is a step below. When the road narrows you’ll feel the width. These trucks are another 170mm or so wider than a Ranger. In town it’s the same story as the 15m to 16m turning circle makes a mortal-sized dual-cab ute look manoeuvrable… and you begin to see why America has special parking bays for these vehicles. But we’re not here to discuss the school run; the more important question is 4X4 touring. These big trucks offer huge space, real towing capacity and considerable luxury – they may be expensive, but one of them is cheaper than many combinations of camper trailer and tow rig. A family of five could easily camp out of an F250, and avoid the modern syndrome of ute overload we see today. If you’re going to tour that means accessories… and the trucks are reasonably well served, especially the F250. Bullbars, winches, lockers and suspension are all available, as are dual batteries and long-range tanks. A canopy can be added to the tub, or a service body fitted. I’d recommend the latter for that giant tray (otherwise access will be difficult). They also are the real deal in the off-road stakes with low range, traction control and a rear locking differential – manually selected for the Ford and automatic for the Chevy. An auto-locker is a bit of a compromise as it’s apt to kick in when you’d prefer it didn’t. The off-road capability is limited by the vehicle size and the long wheelbase, which means a poor ramp-over angle and awkward turning circle. A suspension lift would improve things; and 35in tyres fit easily with no modifications which would increase the ground clearance from the low 206mm (with standard 33in tyres) to about 230mm. We know of owners who run 37in tyres – which would be good for about 250mm. The size would be little issue in the Outback or on beaches, but it would be cumbersome in areas like the Victorian High Country. And the fact remains that our off-road tracks are made for (and by) vehicles no larger than an LC200 – whereas the American trucks are significantly wider and longer so they will constantly run into size issues. But every vehicle runs into some form of issue. If you tow, good luck on those tight trails; or leave your trailer behind. Bigger vehicles are more expensive; smaller vehicles lack carrying capacity; everything is a trade-off. The default tourer may be a mid-sized wagon or ute, but there’s so much more choice than the mainstream. The first trick with choosing your touring setup is knowing what’s available, and only then can you be sure your choice is the best the market can give you. Could it be that the Americans have a point with their big trucks? The Iveco Daily is a light commercial truck. Compared to a big American ute the Iveco is considerably down on power (125kW and 400Nm) and doesn’t have much of the luxury or even the standard items the Americans can offer; and it can tow only 3,500kg; but it’s shorter, runs tall tyres and has twin cross-axle lockers. You can convert your 4X4 to a 6X6, massively increasing payload and lengthening the tray… so like the big Americans you get an extra-cab tray on a dual-cab. Thanks to Performax for the loan of the F250 and the Silverado, and Sunland Caravans for their off-road capable Patriot 186 caravan.